Some travelers are looking for something more than just a motorcycle ride; an authentic experience with reliable motorcycles, comfortable accommodation and nothing to worry about. For those who are looking for experiences beyond a typical motorcycle tour, a motorcycle holiday by AB original Tours qualifies to be called not just a trip but a journey to remember forever. We endeavor to give our guests ‘an experience of a lifetime’. Chris de Blank is a photography enthusiast living in the South West of Western Australia. She did a 2-week tour of Rajasthan with us in MAR 2014. She made a wonderful photo book which is available online on Blurb (Click here), perfect for your coffee table if you love India. She also created a fantastic “View from a Bike” calendar with the photos she took on the back of her husband’s bike while on the tour. Order online on Redbubble (Click Here). In July 2014, Martin & Janet Jenkins returned to have yet another adventure with us, this time a 3-week tour of the Himalayas. Upon his return to UK, Martin wrote another article about their India trip in their club’s (International Motorcyclists Tour Club) magazine, ‘Tourider’ which featured in 2 parts (DEC 2014, JAN 2015 editions). Click to view articles DEC 2014 , JAN 2015 (scroll down to the article within). David Williams did a 2-week motorcycle tour of the Himalayas with us in AUG 2013. Australian Motorcyclist Magazine’s DEC 2013 issue featured an article by him (MOUNTAIN HI, By Royal Enfield through the Himalayas) in which he narrates a candid account of his experiences on the tour. Click Here to download a PDF copy of the pages of this magazine. 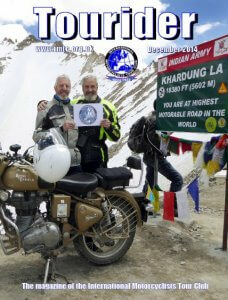 On 15 March 2013, we featured in an article in Ultimate Motorcycling magazine titled “Destination: The Himalayas”. The article contains pictures & information about our motorcycle tours in the Himalayas. ABOUT.COM’s India Travel section features an article by Sharell Cook, “5 Memorable India Motorcycle Tours”, Top Motorcycle tours in India. Our Rajasthan tours are listed at no. 3. 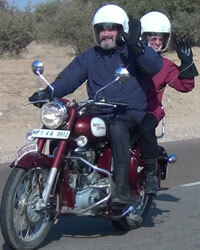 In January 2012, Martin & Janet Jenkins did a 3-week tour of Rajasthan with us. Back home in UK, they wrote an article about their India trip in their club’s (International Motorcyclists Tour Club) magazine, ‘Tourider’ (June 2012 edition). Click here to view a PDF version of the edition (scroll down to page 8).